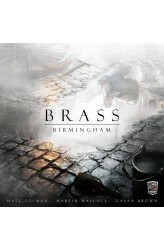 Brass: Birmingham is an economic strategy game sequel to Martin Wallace' 2007 masterpiece, Brass. Birmingham tells the story of competing entrepreneurs in Birmingham during the industrial revolution, between the years of 1770-1870. As in its predecessor, you must develop, build, and establish your industries and network, in an effort to exploit low or high market demands. Each round, players take turns according to the turn order track, receiving two actions to perform any of the following actions (found in the original game): 1) Build - Pay required resources and place an industry tile. 2) Network - Add a rail / canal link, expanding your network. 3) Develop - Increase the VP value of an industry. 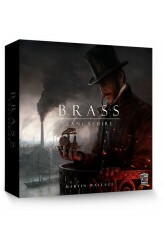 4) Sell - S..
Brass: Lancashire — first published as Brass — is an economic strategy game that tells the story of competing cotton entrepreneurs in Lancashire during the industrial revolution. You must develop, build, and establish your industries and network so that you can capitalize demand for iron, coal and cotton. The game is played over two halves: the canal phase and the rail phase. To win the game, score the most victory points (VPs), which are counted at the end of each half. VPs are gained from your canals, rails, and established (flipped) industry tiles. Each round, players take turns according to the turn order track, receiving two actions to perform any of the following: Build an industry tile Build a rail or canal Develop an industry Sell cotton Take a loa.. 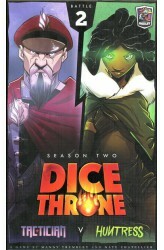 Dice Throne is a game of intriguing dice, tactical card play, powerful heroes, and unique abilities. It's a fast-paced 2-6 player combat game (1v1, 2v2, 3v3, 2v2v2, or free-for-all). Select from a variety of heroes that play and feel completely distinct from one another. Attack opponents and activate abilities by rolling your hero's unique set of five dice. Accumulate combat points and spend them on cards that have a large range of effects, such as granting permanent hero upgrades, applying status effects, and manipulating dice directly (yours, your teammate's, or even your opponent's). 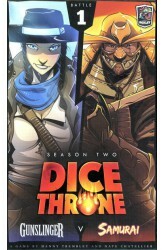 Dice Throne: Season Two introduces a roster of new heroes and intriguing new matchups. A stand alone game supporting 2 players. 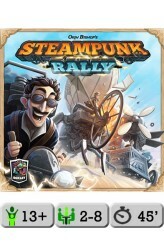 Additional heroes required to ..
Steampunk Rally is a strategy game that incorporates steampunk as more than just a bit of chrome. Using a unique dice-placement mechanism, players take on the roles of famous inventors from the turn of the last century like Nikola Tesla and Marie Curie, constructing fantastical contraptions that make use of steam, heat and electricity in an attempt to win a no-holds-barred race through the Swiss alps. Each round starts with a card draft in which players carefully select machine parts to add to their invention and one-shot boost cards to aid them or hinder opponents. Players also have the option of discarding drafted cards for dice or cogs to power their invention, but they must make this tricky choice when each card is drafted. Then, after venting dice to r..
Mars. The very near future. The Solarus Corporation discovered an infinite source of rare and precious minerals deep in the red crust. Resources that will end the energy crisis on Earth and fuel the deep space expeditions planned as population swells beyond capacity. You have been chosen to lead an elite crew of Pod pilots who will delve below the surface of Mars in Solarus Corporation's first major drilling expedition. As a part of this maiden voyage, the corporation has agreed to let you reinvest any wealth you uncover back into training your Pod pilots, increasing their skills and efficiencies. Will you be remembered as the greatest Solarus Corporation employee in the galaxy? 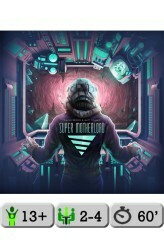 Super Motherload is a tile-laying deck-building game, which means that you have your own deck o..